Waddington Custot Galleries is currently presenting the maverick Clement Greenberg-chewing Barry Flanagan in ‘Animal, Vegetable, Mineral’. The show is a survey of Flanagan’s works from the 1960s, 70s and 80s, curated by Dr. Jo Melvin, including displays of material from the Estate archive, including preliminary works, and photographs. Fifty years after the artist’s first solo exhibition, the real treat of this exhibition is Flanagan’s early exploration of materials and substances. Touted as an early conceptualist along with the likes of Bruce Mclean and John Latham, challenging the staid conventions of sculpture – it was Michael Compton, while selecting works at the Hayward Gallery in 1969, who described the artist’s work as something “paradoxically very cheap and yet unsaleable, a parable therefore of an ideal art”. It is certainly true of Flanagan’s early works, playfully exploring material and substance. The artist valued exploration and language over the weighty materials of conventional sculpture, that he would later lend weight to with the first of his trademark hares cast in bronze, in the late 70’s. Flanagan thought the dark surfaces lent what the artist described as bloom and drama to the work. Flanagan’s hares adopted the energies of humans, Juxtaposing classic materiality with Beuysian shamanism. 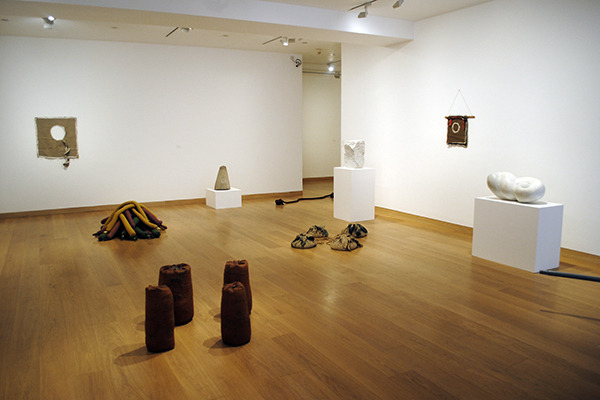 Image: Barry Flanagan, Animal, Vegetable, Mineral, installation view, Waddington Custot Galleries. Photo: P A Black © 2016. It is in fact these latter works that seem to take a back seat to the artist’s vital and energetic early exploration of material and form, and on a first reading appear antithetical. Yet they also serve to highlight the artist’s commitment to language, with a somewhat shocking return to classical sculpture, plinth and figuration. But it is still Flanagan’s earlier irreverent approach to sculpture that holds the viewer’s attention. 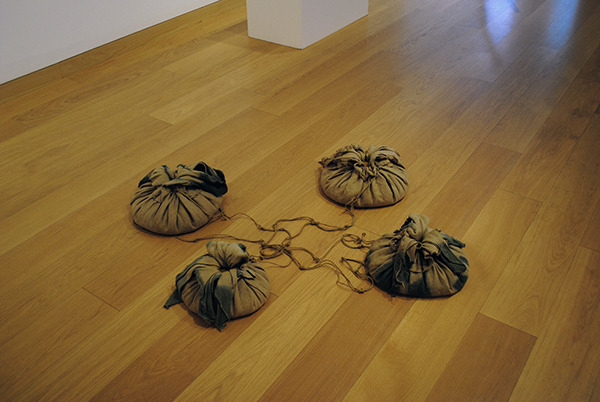 Rope, sand, Hessian, marble – and resin: the artist ‘s focus was on language – material and substance form playful tools. The title of the exhibition ‘Animal, Vegetable, Mineral’ – borrowed from a review of Flanagan’s first solo exhibition in London in 1966 – was perhaps prescient of the artist’s homogeneous use of the world around him. Flanagan decided upon his vocation early in life, stating that he was a fully fledged sculptor from the age of 17, stepping right into it, embracing the physical world, and subverting it. Image: Barry Flanagan, Animal, Vegetable, Mineral, installation detail, Waddington Custot Galleries. Photo: P A Black © 2016. It was a ground-breaking approach to sculpture, in much the same way as his St Martin’s mentor, Anthony Caro’s own subversion of sculptural language in removing the plinth from the sculptural form. Flanagan’s approach was in subverting the very language of sculpture through the juxtaposition of material and substance, abstract titles served to block interpretive meaning over the raw experience of the object. The exhibition dances like one of the artist’s hares through a plethora of materials, from the raw hessian of the artist’s wall-mounted sculptures – blurring the language of canvas with sculptural surface – to marble, rope, pigment, resin, and sand – all with gleeful whimsy. The artist defined himself as an English-speaking itinerant European sculptor, often restless, Flanagan moved swiftly through his projects and collaborations. But it is apparent that these short-lived ventures served to inform his practice with an absurdist’s bent. Barry Flanagan was born in Prestatyn, North Wales, in 1941 and died in Ibiza in 2009. He studied at Birmingham College of Art and Crafts before attending St Martin’s School of Art in London in 1964. Between 1967 and 1971, he taught at St Martin’s School of Art and the Central School of Arts and Crafts. In 1982 Flanagan had major presentations at documenta 7 and the Venice Biennale where he represented Great Britain. An important survey of Flanagan’s early work (1965–1982) was shown at Tate Britain in 2011 and his work is included in their exhibition Conceptual Art in Britain: 1964–1979, which is currently on display. The artist was elected to the Royal Academy of Arts and awarded an OBE in 1991.